New Horizons could have just caught its first ice volcano on film. 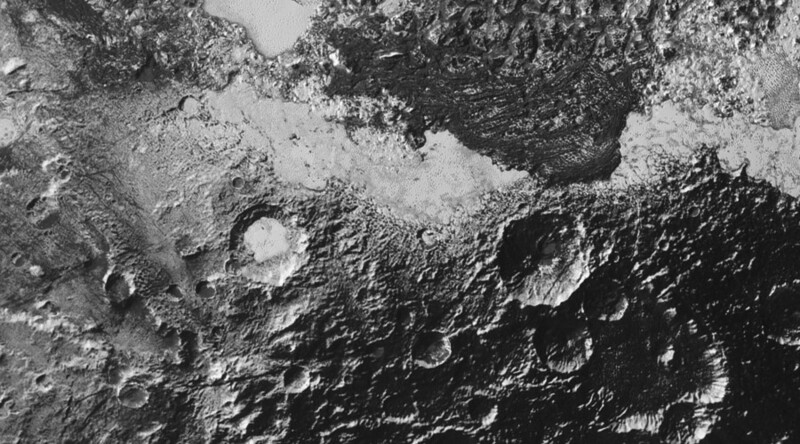 So say NASA scientists who’ve been looking at the latest high-res images of Pluto’s much rougher eastern side. The terrain in the new image mosaic is very different to last week’s photos. This is the closest we are likely to see Pluto. New Horizons has been in the vicinity since July, 3 billion miles away from Earth. The new mosaic depicts Pluto’s western hemisphere, containing an exciting amount of craters and mountains that pierce the dwarf planet’s thin atmosphere. Contained there also is Wright Mons, the prime candidate for being a “possibly cryovolcanic edifice,” the NASA team says. The images contain details as small as 500 meters across. This fact has NASA very excited, as every ridge, pock mark and crater can be seen in detail. “Pluto has greatly exceeded our expectations in diversity of landforms and processes — processes that continue to the present,” said Alan Howard of the University of Virginia, Charlottesville, who collaborates on the New Horizons study, as the announcement was made that we could now study the dwarf planet’s vast network of valleys and cracks, and offer compelling clues as to how they were formed. Scientists are emerging at new models of ice formation on the planet, as well as new data about its mysterious atmosphere. “We’re much less than halfway through transmitting data about the Pluto system to Earth, but a wide variety of new scientific results are already emerging,” said the Principal Investigator on the New Horizons project, Alan Stern of the Southwest Research Institute in Boulder, Colorado. A series of other scientific assumptions are currently being made as to the planet’s moons, as well as Pluto’s interaction with solar winds. The possibility that Pluto could harbor two ice volcanos near its south pole has been around since early November, after analyzing New Horizons’ July photos. The photos were then used to measure the mountains, which turned out to be several miles high and dozens of miles wide. Large holes were seen in the summits, prompting NASA to think it was looking at volcanoes. Now they appear to have their proof. Over on the eastern side, the environment is markedly different, with constantly shifting underground ice, giving the surface a much smoother exterior than in this new set of images.